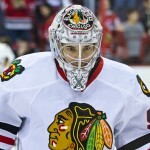 Is Corey Crawford The Real Problem For Chicago? After losing two straight in overtime at home to fall behind in their series 1-3, the Blackhawks face the chance of first-round elimination for the second straight season. With Chicago facing-off in Phoenix tonight, there is question as to who will be in the net for the Hawks. After giving up two, rather soft, goals in overtime, there has been talk of Chicago going a different direction with Ray Emery to start Game 5. Although Emery is a goalie with more than enough talent and playoff experience, the Hawks have to go with Corey Crawford in Game 5. Although 1-3 is not where the Hawks and Crawford wanted to be at this point, the blame cannot all be put on the shoulders of Crawford. Besides problems in the net, for the last two minutes of regulation in each game, Chicago has not played with the urgency or consistency a team needs to make any impact in the playoffs. 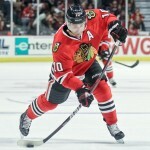 Patrick Sharp, who led the team in goals this season, only has one in the playoffs. In fact, it is his only point. Hossa has not produced inthe playoffs, either. Before his injury in Game 4, he went the first three games without a point! Chicago also has to take a look at the other end of the ice and figure out if Crawford would have let as many goals go had their defense been in position to effectively clear the puck. Skaters’ not playing to potential is the most pressing issue for Chicago for the rest of this series, not their goaltending. Crawford may have let two easy goals go the last two overtimes, but he has not played poorly. Every game this series has ended in overtime. A game, literally, cannot end any closer. Is it Crawford’s fault for letting a goal go in overtime, or is it the skaters’ fault for not making the most out of their overtime opportunities? This is not an attempt to place the blame on any player, line, or missed opportunity. If Chicago feels they have a better chance with Emery in goal for Game 5, great! But if they think goaltending is the only aspect of their game that has to change in order to move forward, they will see the same result in Game 5.